Hundreds of ROC students began their community internships this week, but two lucky (and talented) Pharmacy Tech students were able to score a rare first semester internship which, although now coming to an end, is leading to new opportunties. 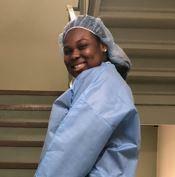 One student was Oreoluwa Johnson who just completed her initial internship at San Joaquin Hosiptal. She is pictured below on her way to stock the OR room full of needed medications. At this job she also had to prep in her PPE (personal protective equipment) or "garb up" prior to entering the OR in order to maintain sterility. Now that second semester is here, Oreoluwa will receive additional on-the-job training as an intern with Walgreen's pharmacy -- a powerful opportunity for her to experience both types of pharmacies. 17 of ROC's 31 programs offer community internship opportunities to advanced students, while the other programs provide industry-approved hands-on shop and project-based experiences for students who remain on the campus. ROC remains committed to training today's students for tomorrows workforce and, as always, thanks the hundreds of area businesses, San Joaquin Hospital and Walgreen's included, who partner with us in this vital mission.